I made a similar version of this necklace last year, and regrettably sold it. I didn't really want to let it go, but I did. I've been thinking of it ever since so I decided to try to make another one. There were two problems though, the first being the copper folded piece. I had no idea how I made it but luckily I did have a picture. So I just started in playing with it. It has a similar feeling to it but isn't quite as nice as the original. The bead was the second problem. 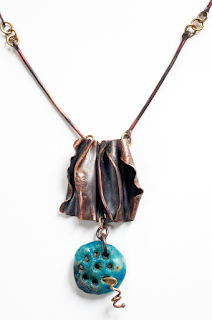 But I felt confident that I could fabricate something similar with polymer clay. When it was baked, I added some brown acrylic paint, dabbed on with a paper towel and rubbed off. It was a real mess, but I'm happy with the final result. 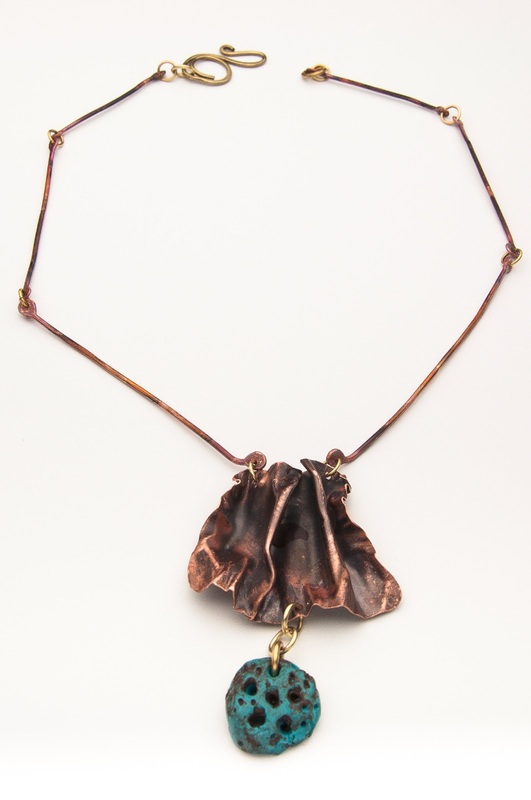 The necklace 'chain' is made from copper wire pieces balled up in the flame and then forged flat. I connected everything together with brass jump rings and a brass swan clasp. Here is a picture of the original piece. I'm still thinking about the little brass tendril poking out from the bead. out of the box! do you have a design background?